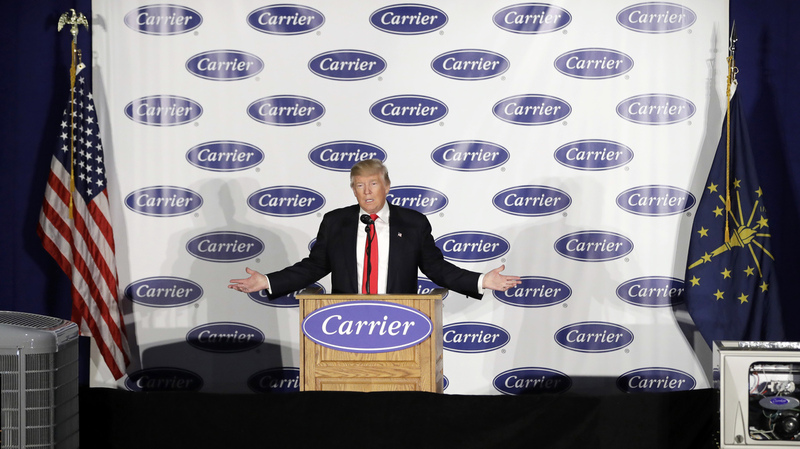 Is Trump's Deal With Carrier A Form Of Crony Capitalism? Steve Inskeep talks with former Commerce Secretary Donald Evans and libertarian economist Tyler Cowen about the problems that arise when a president pressures individual companies to do his bidding. President-elect Donald Trump speaks at Carrier Corp. on Thursday, in Indianapolis. On Donald Trump's visit to Carrier in Indiana on Thursday, he mentioned a phone call that he made to the CEO of United Technologies, the air conditioning company's parent. As Trump describes it, that call led to Carrier announcing it will not move as many jobs to Mexico as it had planned. "We can't allow this to happen anymore with our country. So many jobs are leaving and going to other countries, not just Mexico," Trump said. Trump made it sound as though the decision to keep 1,000 Carrier jobs in the U.S. was done over a handshake. The decision appears to have involved a grab bag of concessions from Indiana, including a multiyear, $7 million incentive package. It's not certain, but there may have been some strong-arm tactics involved, too. United Technologies is a defense contractor that gets a lot of money from the government. Earlier this week, Sen. Bernie Sanders suggested that Trump should use that as leverage in negotiations to keep Carrier in Indiana. Trump himself implied that such tactics will be part of his strategy to convince U.S. companies to remain in America. "No. 1, we're going to treat them well, and No. 2, there will be consequences," he said. Donald Evans, commerce secretary during George W. Bush's first term, says the deal definitely signals a change in approach between the White House and American businesses. But, he warns, dealing directly with each business as Trump did with Carrier is not likely to be a staple. "You can't get involved in every business all across America. You have to create the environment for those businesses to do so well, and that's exactly what President-elect Trump has in mind," he tells NPR's Steve Inskeep. But Tyler Cowen, professor of economics at George Mason University who identifies as a libertarian, worries that under a Trump administration, a kind of "crony capitalism" — where companies that are good to a presidency are rewarded — will prevail. "This to me is scary," Cowen tells Inskeep. "It indicates an environment where business decisions are now about how much you please the president." Evans: You cannot do it all the time. You've got too many things on your plate. There will be isolated situations from time to time. This happens to be one of them that was brought up during the course of the campaign. [Trump] wanted everybody to know that ... as president, he's going to fight for jobs in America. Now, exactly how this all came down and what added incentives were thrown in there or not thrown in there, I have no idea. But I don't think it's a bad thing for the president to send a strong message to the workers of America that he's going to create the environment for them to do well right here and send that same message to the corporations of America. Cowen: We're supposed to live under a republic of the rule of law, not the rule of men. This deal is completely nontransparent, and the notion that every major American company has to negotiate person-to-person with the president over Twitter is going to make all business decisions politicized. We don't know exactly what the company is getting. There's plenty of talk that the reason Carrier went along with the deal was because they were afraid their parent company would lose a lot of defense contracts, so this now creates the specter of a president always being willing to punish or reward companies depending on whether or not they give him a good press release. Evans: Certainly over the long haul you can't get into the mode of picking winners and losers. The great hallmark of this country is we love to compete. And so what I think government's role needs to be, should be, will be under this president-elect, I'm confident, is create a playing field for our companies in America to compete not only here at home but around the world and provide that environment so that companies here in America are willing to stay here, employ more people and build their companies here in America instead of some other country in the world. Cowen: They do a lot of defense contracting; it's at least 10 percent of their revenue. Carrier from the state of Indiana was already offered the tax break before the election. They turned it down. Now all of a sudden Trump is president, Bernie Sanders is telling Trump to threaten the defense contracts of the parent company. And now all of a sudden the company takes the deal, and Trump is known for being somewhat vindictive. Cowen: Trump and Bernie Sanders, for all of their populist talk, their actual recipes in both case lead to crony capitalism ... a system where businesses who are in bed with the government and who give the president positive press releases are rewarded and where companies who oppose or speak out against the president are in some way punished.